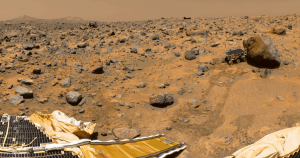 Since 1996, NASA has successfully sent four robotically controlled rovers to Mars. And now, the agency wants to launch its first sample return mission— as soon as 2026. “We will continue planning and developing the first round-trip mission to the Red Planet with Mars Sample Return,” NASA chief Jim Bridenstine said in an official statement. U.S. President Donald Trump revealed NASA’s budget requests today for next year, accounting for $21 billion total. The request for the sample return mission to Mars was listed under “Moon to Mars” in the request, as Space.com reports — a section that highlighted the agency’s needs for making human space exploration a reality. Details are still sparse. The sample return mission would follow the deployment of the Mars 2020 rover mission next year, and NASA suggested the return mission could happen as early as 2026 in an official document. But 2026 is a very aggressive timeline: there’s still a ton of work to be done. The real focus of the budget request seems to be the Moon, with lunar exploration accounting for more than $500 million. The budget also includes new lunar lander initiatives that could deliver cargo and eventually passengers to the Moon, and mentions plans for a Lunar Gateway that could act as a stepping stone to far more distant destinations. Also important to note: none of these numbers are set in stone. Congress has yet to approve NASA’s budget request.